Final Fantasy Ultra just got better! The philosophy is still to add and change as much as possible for the better, while still staying true to the spirit of the game. X. Version 1.1 has an easier Volcano section and many little improvements. 1. Enemies have more hitpoints, making fights more strategic. 2. BLNK (evasion for one character) has been replaced with SLD2 (about as strong as the original SHLD). There’s now a SLD3, which is about as strong as the previous SLD2. 3. Some of the white spells have been shifted around for balance reasons and to make classes more specific in their role. 4. CUREring replaced with TMPRring. 5. Ninja now gets 4 attack rating per level. 6. Lots of little aesthetic changes, like new colors for the classes! 8. You can’t get to the Ice Cave unless you have the Airship. Too many playtesters went there for the Floater! 9. Two new secret equips. Good luck finding out how to use them! 12. Volcano dungeon got nerfed, Water shrine buffed. 13. Paladin, Ninja, Ranger, and Monk cast slightly less spells. 14. Running away is harder and better balanced. Each class is especially good at one thing and average to bad at everything else. Except the Fool class, who is bad at everything. Battle animations sped up. Spells are divided into direct (the top two spells in a store) and indirect (the bottom half). Many spells added and altered. Every level of magic has a single target damage spell and all enemies spell. FIRE only hits one enemy, making the HARM spell better against armies of undead. Generally less spells that kill or stone in one hit. More spells can be cast, especially for dedicated casters. Intellect influences the power of spells. Spell damage is also stronger, but since hitpoints have also increased, damage spells are only relatively stronger for casters with high intelligence. More interesting enemy properties, such as regeneration and elemental properties. Everything has more hit points, making fights more tactical. Enemies drop less gold, making chests much more attractive, and forcing the player to choose between which items they want to buy the most. Only two types of armor (Body and Shield) so there’s more room to store magical items. Only the 10 magical items can cast spells. Poison and regeneration is now at 10%. Any combination of classes (without twins or Fools) can properly beat the game. No combination of classes is remarkably better at beating the game than another. Added escape teleports in most of the dungeons, making it more attractive to level up where the action and gear is. Balanced game to make full trip through whole dungeon on first try very hard, but rewarding to go in, get some loot, restock and go in again to get further. Most dungeons take around three trips to complete. Most fights can be run away from, except on ‘tiled’ squares. Dragons, Mindflayers, Eyes, Worms, Basilisks, and Bosses are not runnable. Getting the Ship, Papyrus, Oxyale and Crown requires doing a dungeon. Four extra dungeons to do after Tiamat. All sorts of new paths and new tricks. Dungeons feature items found in nearby towns, giving incentive to try to get the items there instead of just buying them in shop. End dungeons feature special end-game weapons for each class. Boss battles made much more interesting. Player doesn’t need Ship to get to Elves. Player doesn’t need Airship beat the game, as ports have been removed. Three places where player can fight against tougher enemies for experience boost if they’re into that kind of thing (like the original PoP). You now save a prince instead of a princess. Corneria has two queens. For gender diversity. Secret overpowered enemies for bragging rights. Mystic Key only unlocks items in Dwarf Cave, Elf Castle and Human Castle. Hundreds of tweaks not worth mentioning. Years of polish thanks to dozens of playthroughs and feedback from playtesters. Credit is due to PinkPuff for letting me build upon their hack, Final Fantasy Negative One. Having found and played many hacks through this site and forum(well done team), this particular mod is the first that drove me to create an account here. Despite countless views, and participation of many other mods, I write now because of this one. Other modded game favorites of mine include super metroid, mega man anything, countless other games on here, and of course all of the final fantasies. I have been playing and dabbled in mods for a long time. 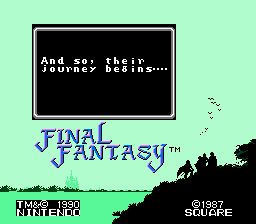 This original game, on the NES, was Final Fantasy 1. For anyone that’s as into FF as I am and have been, that played 1, the vanilla unu on console with RL save; this should be especially entertaining for them. To review the mod specifically, I simply have to start by saying that is all around excellent thus far. I have just completed defeating Lich and lighting the Earth Orb, and man has it been a wild ride so far. The list of chooseable characters from the start alone will probably leave you wanting to replay. The openness of the ship (which has its own brand new dungeon to acquire) that can land anywhere opening the game up from the early onset. So many things feel well balanced. You are pressed, tried, pushed, but as long as you know your strengths, spend a little time gathering money (so precious, is the money), make sure you have most of the spells you think you will need, and success isn’t far off. There is great support in the readme. Can’t rave about this game enough and I feel like I’m just finally getting into the real meat of the game, based on the team I have picked. My most sincere and respectful props to this mod’s creator: Absolutely Well Done. Play this game now, if you ever loved the original FF1.